Virgin Galactic followed up on last December’s first SpaceShipTwo flight past the 50-mile space milestone by sending up its first non-pilot on today’s test flight. The crew member who accompanied the two pilots was Beth Moses, Virgin Galactic’s chief astronaut instructor (and wife of the company’s president, Mike Moses). Today’s test sent the SpaceShipTwo rocket plane, VSS Unity, to a height of 55.87 miles (89.9 kilometers), Virgin Galactic said. 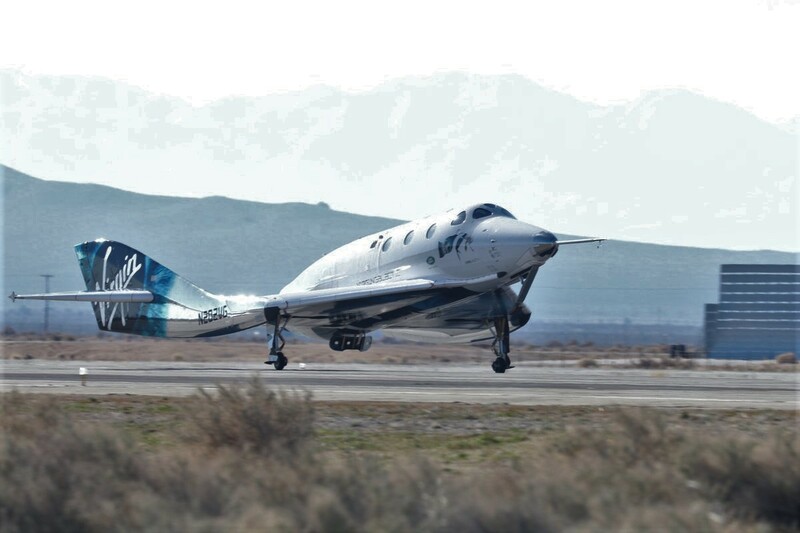 The flight followed Virgin Galactic’s usual profile: Unity was slung beneath its WhiteKnightTwo carrier airplane, VMS Eve, for takeoff from California’s Mojave Air and Space Port. At an altitude of about 45,000 feet, Unity was released into the air and fired its hybrid rocket engine for a minute, screaming toward the black sky of space at a top speed of Mach 3.04. After a zero-gravity coast at the top of the ride, Unity glided back to the airport for an airplane-like landing. Eve made its own landing minutes later. It was Unity’s fifth supersonic test flight, setting the stage for what could be the start of commercial operations at Spaceport America in New Mexico later this year.